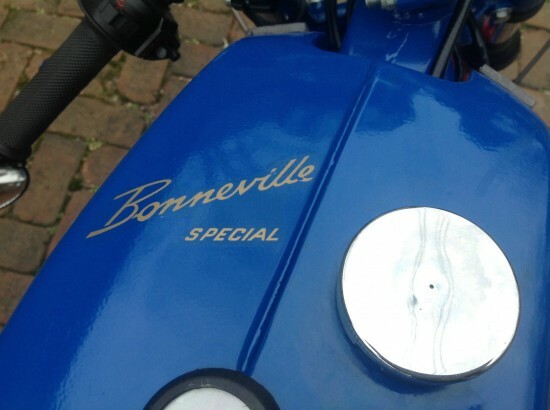 I don’t often post up Triumph Bonnevilles here, since they seem sort of common for a site with “rare” in the title. 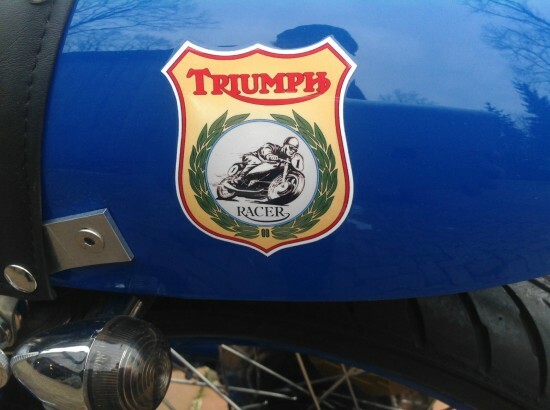 They did sell quite a few of them over the years and, while they pretty much epitomize “classic bike” for many people, I think they’re a little too obvious most of the time. The Triumph Bonneville was a very popular and long-lived machine, made from 1959 until 1983. The original “T120” was powered by a 650cc parallel twin, with an updated 724cc [“750”] model introduced in the early 1970’s and designated the “T140” that featured disc brakes and a left-side shift to comply with US regulations. 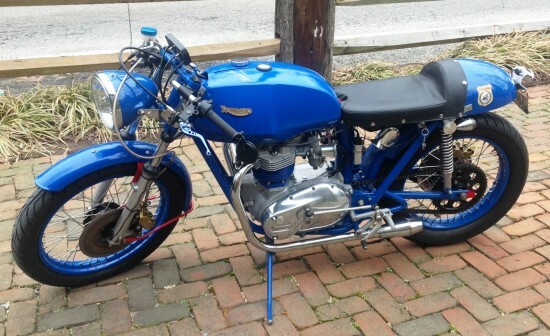 This very, very blue Triumph Bonneville may not be to everyone’s taste, but the listing includes some nice “under construction” photos, which I always appreciate: there are more pictures of the build than of the completed bike. The engine was completely stripped down, the cases split and everything was cleaned and inspected. Every single bearing was replaced as were all the seals. The head was completely rebuilt with new valve guides, valves and springs. Small repairs were made to the cases where some of the threads had been stripped. Gear box was completely stripped down, a new main shaft put in and several worn gears replaced. The engine was rebuilt by Bob Wolf of Arbutus, MD. The barrels and pistons are .006 over and crank, pistons and con rods were sent to “House of Balance” here in Baltimore for balancing. It has all new clutch plates and a new stator. 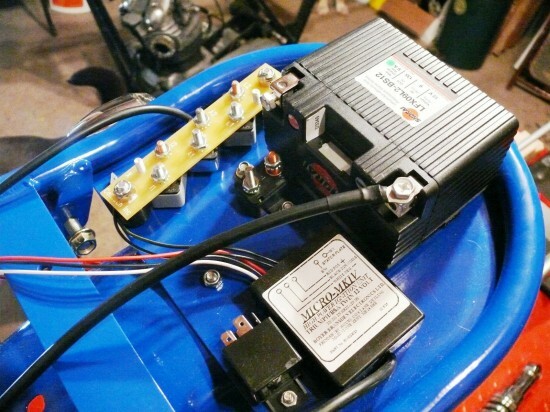 The battery is a light weight lithium model from Shorei and it and all main electrics are under the seat with a metal plate welded into the frame to hold them. No fuses are used instead there are a set of circuit breakers. 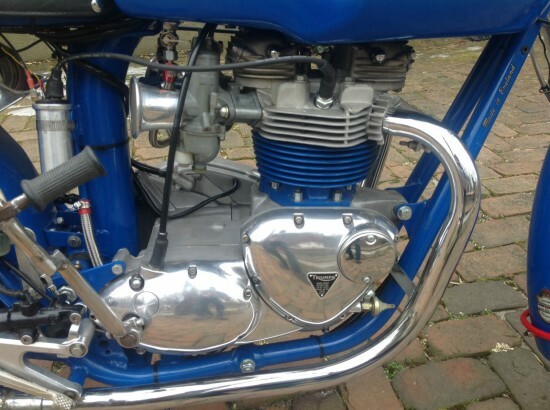 The seat is secured to the frame using the same method as on a Norton Commando which makes seat removal a simple one minute job should you need to access the electrics. There are two incredibly loud horns mounted under the seat so you won’t have any trouble alerting the cage drivers to your presence! A new electronic ignition from Boyer has replaced the points. The bike uses new digital instruments from Acewell as I wanted to try to do a blend of old and new. The old style Lockheed brakes have been replaced with modern Nissin four pot calipers and the lines are new as well, of course. The front forks were completely stripped down and rebuilt with a mixture of new and used parts. The rims are powder coated to match the bike and both hubs were rebuilt with new bearings and the wheels were laced and tuned with stainless steel spokes by an experienced wheel builder here in Baltimore. 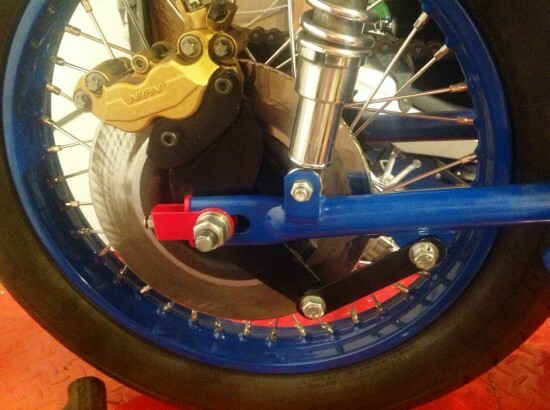 The unusual rearset set up and foot pegs are off a Yamaha R6 and a slight mod had to be made in the kick start to allow for this. The tank is an old British spec steel tank, increasingly rare here in the US and it has been sealed inside with Carswell tank sealer and powder coated on the outside. I definitely appreciate the upgraded brakes and, although I think the digital dash looks out of place, it was clearly a very intentional choice since the builder took so much care with the rest of the build. I’d certainly imagine it’s far more accurate than any old cable-driven, Smiths gauge is likely to be, although you can probably shift an old twin like this by ear, making a tach more of an accessory that a necessity. This isn’t the most polished bike: some of those connectors on the coil look like they could use a bit more time and attention and the wires and cables on the front end could definitely be cleaned up. But this looks more like a labor of love than a high-dollar toy, and I really like it. So all-in-all, a very distinctive ride. That price though: it’s a bit of an ouch. The seller mentions that he doesn’t expect to get back everything he’s invested, but a very specific creation like this needs to find a very specific buyer, one who appreciates the vision the builder had when putting it together. It’s far from a restoration, and nothing like original, but this resto-mod is a pretty cool machine. I’d say it could use some attention to the details, but nothing you couldn’t attend to on weekends, a bit at a time, and nothing that will keep the bike off the road for long. Man that is alot of blue! Other than the copious amount of blue IMHO this is a pretty good build alot better than some of the cobbled builds I see on ebay. Only things I would do is use thr new Smiths electric speedo and tach, chrome or aluminum rims, chrome headlight bucket, black cylinder block, and as mentioned better connections for the coils. Oh, did I mention the over use of blue paint.